Often we wonder how Native American food started and how does it change throughout the years. Foods of the Native Americans vary from tribe to tribe. In Alaska, the Athabaskan Indians had a different diet from the tribes of the Amazon in Brazil. Other tribes were very much agricultural. They stayed in one place for quite some time to do farming so they could have something to eat. The semi-nomadic tribes, however, moved frequently from one place to another to hunt and gather foods for their families. 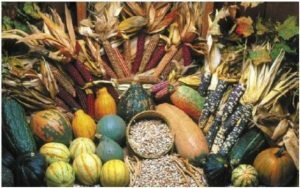 Native American food sources and gathering have also developed throughout the years to fit their needs. The four primitive ways of sourcing foods then were hunting and fishing, farming, gathering and raising animals. Native Americans did these methods but the most common were the first three mentioned. This was because, in North America, there were few domesticated animals before Europeans arrived. Only dogs, ducks, and turkeys were the existing and only small numbers of tribes eat dog meat. In order to have a varied diet, tribes used a combination of two or three ways of the food-sourcing methods mentioned. 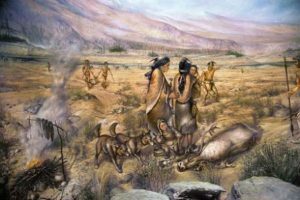 Native Americans did hunting and fishing to get and eat meat. Indian tribes and the Eskimos mostly relied on hunting and fishing for food survival. Some of the Native Americans primarily hunt for food through hunting. They migrated frequently to look for caribou or herds of bison. The Sioux and Blackfoot tribes were known to be good hunters. Large tribes of Native Americans worked together during hunting. They used man-made pits, cliff, fires, and fences or even help each other kill large animals. The Creeks or Chippewa tribes, however, hunted for rabbits and deer. Some native Americans like the Salish and Tlingit were known to source food through fishing. They would either look for marine animals or catch fish through wooden traps and fishnets. Fishing and native hunting varied from each tribe but bows and arrows, harpoons, spears, blowguns and fish hooks were the most common tool. Corn was used to be the most common native American food. Other common foods include squash, beans, pumpkins, wild rice, sunflowers, potatoes, tomatoes, peanuts, peppers, papayas, avocados, and believe it or not, chocolates. Usually, procedures for cooking native American meals were simple. Most native Americans would prefer eating their meals fresh, without having to use a lot of spices. Central America and Mexico, on the other hand, were known to use a lot of spices in their meals such as cumin, peppers, and other seasonings. Native American meals were usually grilled or roasted meat, smoked or baked fish, and stews and soups. Native American meals also varied. Corn, for example, was eaten in many ways, such as corn on the cob, hominy, popcorn, cornbread cooked using clay ovens and tortillas. Desserts like maple candy and fruit puddings were famous for some Indian tribes. Water was always taken with meals for most of the Native Americans but tribes from Mexico often eat their meals with hot chocolate as it was a popular beverage for them then. An alcoholic drink made of corn called chicha was developed by Native American tribes of South and Central America.